It’s Day 12, with one more to go until tomorrow’s Sound Dreaming CD Concert. Although I’ve talked a lot about the Hypogeum in these postings, I wanted today to highlight the last piece on the concert - entitled “Into the Hypogeum”, created from my 2004 recordings. During the concert though, I’ll be changing things up from what’s on the CD. Several years ago, someone I met wanted to do a remix and put beats to this piece. I was reluctant, although the idea was intriguing. So now the time has come to venture into that terrain, and I’ve found the perfect person to collaborate with on this idea - Ian de Souza. I’ve sent him the separate tracks used in the composition of the piece, and he will use those as sound sources to improvise along with me. Eventually, beats will be added, as well as live sampling of my voice into a looper, and the layers will build and build, until as Ian puts it, we end up in a “frenzied froth”. This is entirely appropriate for the ecstatic state that one can so easily go into when sounding in the Hypogeum. In fact, I remember that one of the things Marlon Briffa, who worked as a guide in the Hypogeum, told me was that he believed that the powerful force of the sound vibration was in part intended to raise the kundalini energy. It was a bringing together of the masculine and feminine energies, the yin and the yang. In thinking back on this over the last day or so, I recalled the many things that I’ve read about the acoustics in the Hypogeum over the years. One of the consistent statements that’s made is that it’s only the low male voice that can set the hypogeum into a state of vibration that can be felt in the bones or resonate throughout the space. Not ever believing that fully, I wanted to experiment with it while there. During one of my recording days, Marlon came to participate with me. As he sang the low frequency, I sang 3 octaves higher than him, and sure enough, that high tone set things ringing and vibrating as well. It was a different quality, but definitely there was a strong resonance present that penetrated deeply into my body. I had a similar experience at one of the outdoor temples that is situated not far from the Hypogeum– the Tarxien temples. These temples are renown for their remarkable spiral designs on many of the stones. One day I tried an experiment that Thomas Anderson had told me about. Thomas is an acoustic engineer who was doing research with sound at the temples during my second trip to Malta in 2007 and whom I spoke about in Day 9’s post. 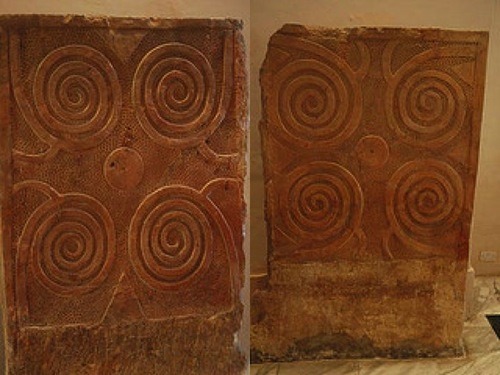 At the Tarxien temples, there are two large slabs that each have two pairs of spiral designs on them, with a large circle dividing the upper and lower pairs. These slabs sit on either side of a doorway or entranceway into one of the temple apses. When you look at today’s picture, you get an idea of what these looked like. The experiment was to have two men sing an octave apart, and each direct their sound onto either side of the large central circle on one of the slabs. Then myself and another female friend stood at another doorway leading into the most inner temple apse, and sang 3 octaves above the lowest note. Everything started buzzing at that point and my head started swirling. Surprising, since we were outside, and the acoustics less contained. But something was definitely being set in motion. From both the experiences I’ve described here, I would say that both the masculine and feminine voices were needed to create a full experience of the resonance possibilities. There is obviously more to be said about the spiral designs themselves, but that’s an entirely different topic. They feel though very connected to the spirals on the Hypogeum Oracle Room ceiling. It was suggested by Paul Devereux (again see Day 9) that the spirals could be an early form of music notation. Perhaps they were more than notation, but rather were indicators of where to place the sound in order to maximize the sympathetic resonances. Or, in other words, how to set up the vibrational patterns to affect the brain wave states. Something to consider. Coming back to the piece on the CD “Into the Hypogeum”. It’s my first piece with the Hypogeum recordings, and although it doesn’t really have much to do with these experiments I’ve been talking about, the vibrational resonances of the Hypogeum are present throughout. some of the duet improvisations I did with Marlon are also included in the piece. Kundalini rising, yin and yang complimentary energies. The alchemy of sound can hold it all, and, set it in motion.